It looks like the Cuboid is back, but this one has some interesting new technology that’s supposed to simplify operation. 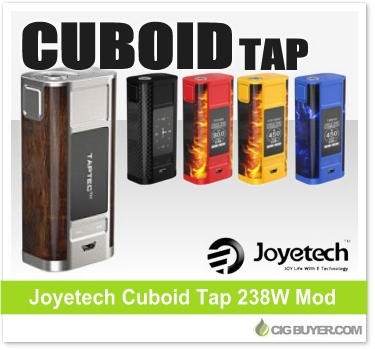 As the name suggests, the Joyetech Cuboid Tap Mod incorporates Joyetech’s new TAPTEC technology, which allows you to simply tap the device in specified areas to fire or adjust the settings. It still has traditional firing and adjustment buttons, but TAPTEC makes operation even easier. Powered by dual 18650 batteries, the Cuboid Tap Box Mod has great aesthetics and features a huge 1.3 inch OLED display with up to 228W of output and full temperature control (Ni/Ti/SS/TCRx3). We’ve also heard that replaceable sleeves will be available to further customize the device.